This past Sunday, May 21st, I made the pilgrimage to the New York National Stationery Show (as I have for many years). The New York National Stationery Show takes place every May at the Jacob Javits Convention Center. While I have been absent from the show for several years due to declining vendor participation, I did look forward to meeting with several key partners this year. I was also hopeful that I could pick up some new lines. First of all, my day started at Shoppers Food Warehouse to pick up a couple of their Colossal Doughnuts. Also, those of you that don’t live in the DMV area might wonder why I write that. But if you happen to be in the DMV, these are the best doughnuts anywhere. 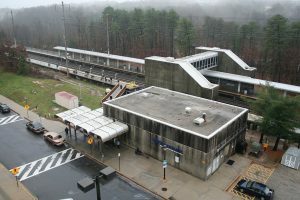 I arrived at the BWI train station at 7:30am. I promptly met Chuck Littlefield (my Rhodia, Diamine, Kaweco, and Retro 51 representative). Chuck and I go way back to 1985 when he was a sales rep when I opened my first store. We arrived at NY Penn Station on time, and it was off to the New York National Stationery Show. My first stop was the Yafa booth to see my friends Jerry Greenberg, Ken Jones, and Ross Cameron. Ken showed me the latest from Paninfarina, Hugo Boss, Parafernalia, Monteverde, Conklin, and Stipula. I’ll have a lot of these up on the site soon, but I had to put the Parafernalia up as soon as I got home because this pen is too cool. After a full review of all the products from these great lines, I was ready for lunch. Jerry invited me to join him, and I was happy to spend some one-on-one time with him. We both have had a passion for pens for a combined 75 years, and a friendship for over 30. We’ve seen a lot of changes from marketing with postcards, catalogs, newspaper, and radio. 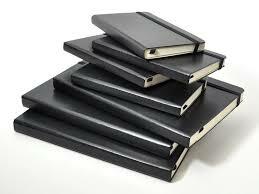 I even had a “black book” of customers whom I personally called every time a new limited edition came out. We were both amazed how the pen business has changed in the last ten years, from these old marketing practices to today’s web-based business and social media market. Jerry has been a dear friend to me, and it was great spending time with him at the New York National Stationery Show. After lunch it was back to work, and I was ready to walk the aisles and see what the show had for me. I met Chuck at the Retro 51 booth, and as always, was pleasantly surprised by what was new. There were three new Tornados. 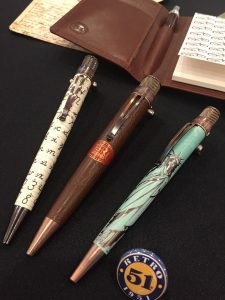 In the Vintage Metalsmith series, the Cursive, which appears to feature the Palmer Method to stroke the letters of the alphabet, is wrapped around the pen. A theme that was quite popular back in the day, Retro brings back a cigar themed pen. Profiled on a Big Shot, the textured brown covering gives the look and feel of a real tobacco leaf. There’s a bright red cigar band beneath the clip with a logo of R51 Premium (representing the Retro brand). Finally, I was happy to hear that the third pen wasn’t going to be one of their limited edition Poppers. Otherwise, it would be sold out already. Retro 51 scored big time with this new pen. Her name is Lady Liberty. It’s colored in patina green with Lady Liberty depicted around the pen, and trimmed in vintage copper colored accents. I ordered all 3 pens at the show. I hope to have them in the next week. On to the next stop at the New York National Stationery Show. I met my friend Greg Hengesbaugh, the national sales manager for Caran d’Ache. The folks known for the $40+ bottle of ink. While I didn’t order any $40 bottles of ink, I did see the new Peter Marino limited edition fountain pen. With only 150 pieces made worldwide, I’m hopeful that I’ll get my complete order because this is one really cool pen. The fit and finish of their products is second to none, and this fountain pen is no exception. From the skull and the onyx eyes, to the softness of the leather that wraps around the pen, this is a masterpiece. 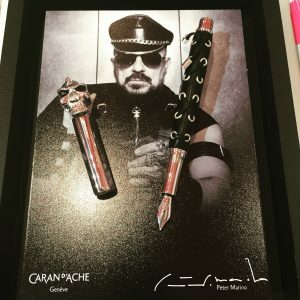 This collectible will go beyond the fountain pen and Peter Marino community, to someone who’s looking for an exceptional work of art. While there, I was able to fill up on my Caran d’Ache pencils (pencils, highlighters, and metallic crayons), and Mobius & Ruppert sharpeners. With these three vendors behind, I was able to do a little “new business”, so to speak. I landed on a company that I’ve been eyeing for quite some time. 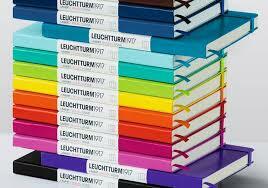 Leuchtturm 1917 out of Germany had a beautiful display. It looked like an absolute dream come true for all journaler’s, sketcher’s, appointment booker’s, bullet journaler’s, and folks who just love notebooks. These guys have enough notebooks and related merchandise to fill my entire store. But I settled on a display that holds 72 medium sized notebooks. I’m hoping that this is the start of a really great working relationship with this top-notch company. With time running scarce, I had hoped to find John Gilbert of Luxury Brands USA, importer and distributor of Platinum Pens. In my time constraints, neither I (nor the staff at the New York National Stationery Show) were able to find him. These pens from Japan are value-priced and very high quality. You may have seen the Platinum Iron Gall inks on our website, which we have done well with. We hope to have more Platinum products in the store and on the site soon. Another company, which I did see before I had to leave, was the Written Word Pencil Company. They make recycled newspaper pencils. 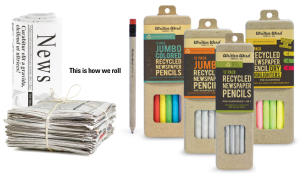 Each pencil is individually hand-crafted, using 100% recycled newspaper. They’re available in standard graphite, colored, and dry highlighters. All are jumbo size. Their motto is: “This is how we roll”. Another company called Xonex has fun rainbow pencils. One end is white, and the other is black. While you sharpen them, the sharpened portion has colors like a rainbow. I have no definitive plans on either of these. It’s just neat to see the innovation and the entrepreneurial spirit of the products at these trade shows. 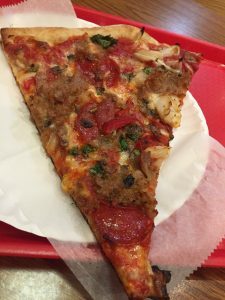 Also, with my train leaving at 18:00 hrs, I had just enough time to enjoy a slice of Meat Lover’s Supreme pizza at a traditional NYC Pizzeria. They must have had 20 pizza’s under glass. After I made my selection, they tossed my slice in the oven. Then they asked if I wanted it warmed or extra crispy. I replied crispy and they did just that. As a result, I washed the pizza down with a couple of pints of IPA. Finally, I was ready for a nap and a leisurely train ride back. The train got back to BWI station, and I was home by 21:45 hrs. I look forward to attending the New York National Stationery Show again in the future.